Regal Bulk Granulated Garlic - 25 lb. Regal bulk granulated garlic is a quick and effective substitute for fresh garlic and the perfect choice for your business. A 25 lb. bag of Regal bulk granulated garlic has a spicy and pungent flavor profile that is sure to add something special to signature dishes at your foodservice establishment. A member of the onion, chive, and leek family, garlic is a pantry staple that can be used in marinades, tomato-based sauces, and soups. 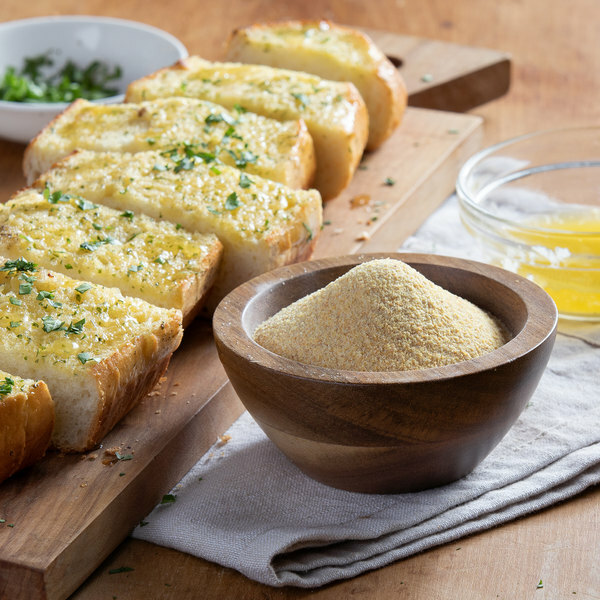 Whether you own a pizzeria, Italian restaurant, or upscale bistro, granulated garlic is the perfect addition to all of your favorite menu items. "The Regal line of spices is great quality. They are always fresh and fragrant; full of flavor. The granulated garlic is great for seasoning many types of dishes and for use in dry. Its my go to spice at home." 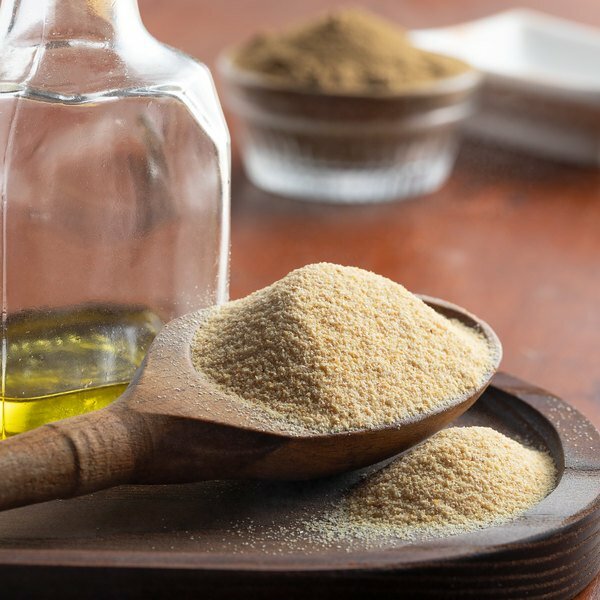 These granules are larger in size than garlic powder but smaller than minced garlic, offering a balanced texture that works well for a variety of menu items. The unique and delicious flavor and aroma of garlic is commonly used in Asian, Middle Eastern, Latin American, and Italian cuisines. However, it also works well with traditional American dishes and can even be eaten alone. This 25 lb. bulk bag of granulated garlic is a cost-efficient option for high-volume kitchens and can easily be portioned into smaller quantities. Dehydrated spices also last longer than fresh ingredients and are easier to store, making them the perfect addition to any busy, high-output kitchen. Regal Herbs and Spices are a smart addition to any kitchen, and this handy 25 lb. bag will satisfy all of your cooking and seasoning needs. Be sure to check out our quantity discounts for even better wholesale savings! 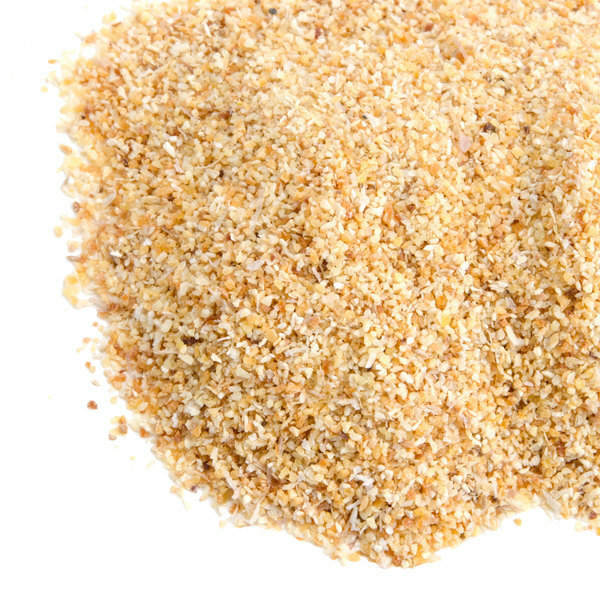 What is the difference between granulated garlic and garlic powder? The difference lies in the grinding process. 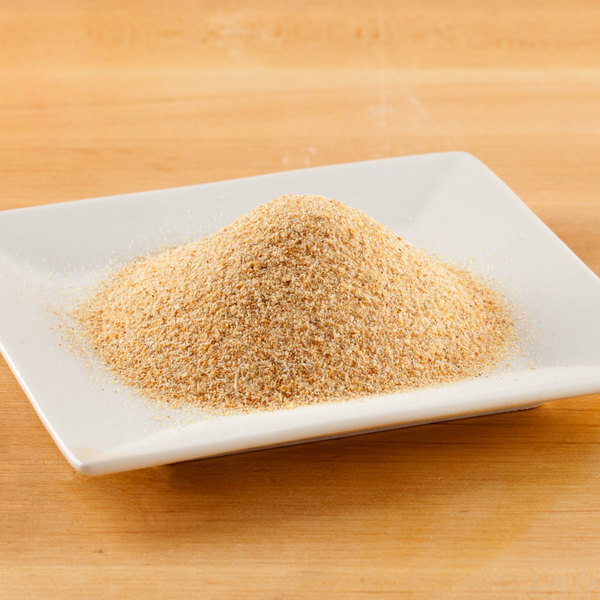 Granulated garlic is ground into granules with coarse texture, like fine cornmeal. 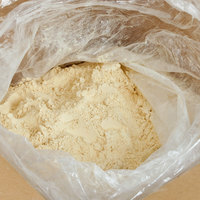 Garlic powder is ground into a fine, flour-like substance. Garlic powder is ideal for dispersing in liquids. It dissolves almost instantly when incorporated into any dish; granulated garlic takes a few minutes to dissolve and release its flavor. Both granulated and powdered garlic can be used for dry rubs, seasoning meats for grilling, and other meat flavoring applications. While powder is cheaper, it can be a bit more difficult to work with (it adheres to damp surfaces and has a tendency to stick to the pan). Use the following substitutions for granulated, powdered and fresh garlic. Please note: All measurements are approximate. - If substituting garlic powder for granulated garlic: 1/2 teaspoon garlic powder is equal to 1 teaspoon granulated garlic. 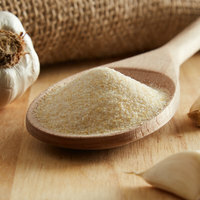 - If substituting granulated garlic for fresh garlic: 1/4 teaspoon granulated garlic is equal to 1 fresh clove. - If substituting garlic powder for fresh garlic: 1/8 teaspoon garlic powder is equal to 1 fresh clove. 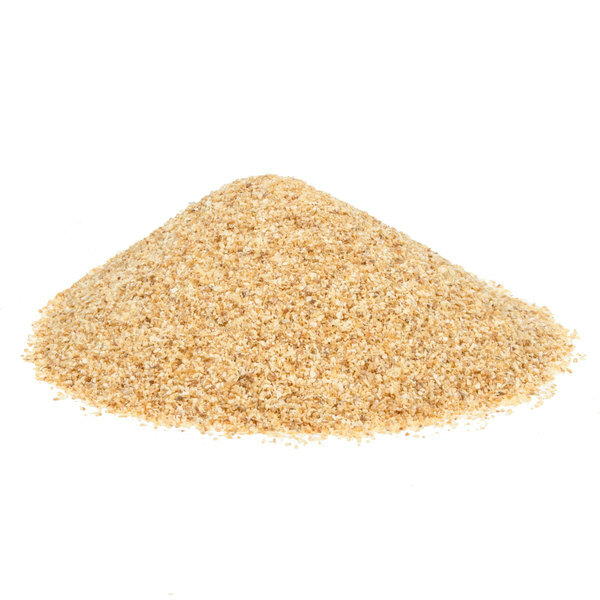 Item #: 102707696 Regal Bulk Granulated Garlic - 25 lb. Item #: 10201108 Regal Bulk Garlic Salt - 25 lb. 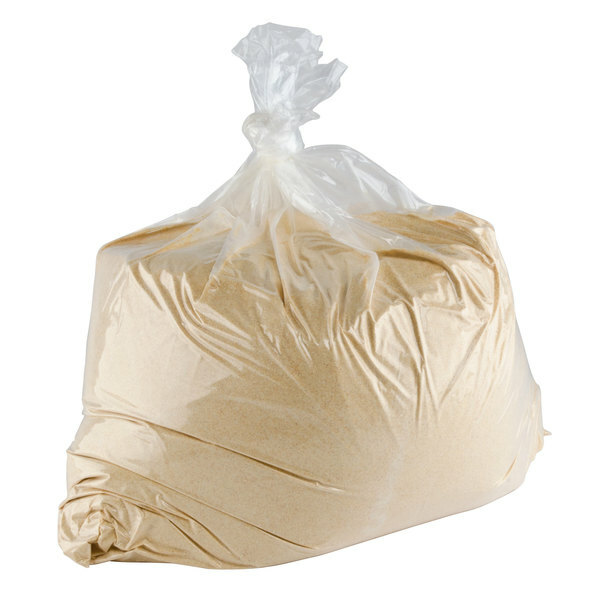 Item #: 102707700 Regal Bulk Garlic Powder - 25 lb. Overall User Rating: Regal Bulk Granulated Garlic - 25 lb. This is a really great deal on bulk granulated garlic. We use a lot of garlic in almost all our dishes. I am really happy to have found a great garlic at a great price. We absolutely love this granulated garlic. We have been using it for years and will continue. The pill packaging is wonderful and so is the price with plus shipping!! I usually pick up my spices from the restaurant supply store but I recently signed up for "Plus" and this is free shipping so I decided to give it a try. All of the spices I have tried from Regal so far have been amazing! They have been just as good quality as what I was getting from the restaurant supply store if not better! Great price for bulk granulated garlic. Use this in all my meat rubs, sauces for dishes, staple of my hummus, etc... The bigger question may be what can't you use it in? Great deal on granulated garlic. Saves a couple bucks compared to my wholesalers price. And the quality of what you get is good for the price! I was very surprised to find bulk in granulated garlic for this price. This was a good buy! The price on Webstaurant is very competitive. This is just as good as any other brand. I would recommend it. When you need that pungent flavor of garlic, look no farther than the Regal brand. Use this in marinades and garlic hot sauce and got rave reviews. Thanks for supplying this product. Just started ordering in 25lb increments. Best decision! Same great quality and fair price break. Packaging securely houses the bulk, plastic bag of spice, which was a major concern, too. This is Great product. Just what I needed and showed up when it said it would. Will definitely be making all my purchases thru webstaurant. This is such a great deal if you use a lot of garlic.. This is a fraction of the cost of what we get this from our vendors.. We order cases at a time. We absolutely love this granulated garlic and use it in almost everything. Gorgeous color and non clumping. Fresh and fragant. The taste is like fresh grated garlic cloves. My only complaint is the price of this more than doubled since the last time I bought it. 4 stars! We bought this 25 pounder garlic in bulk and saved a ton. The quality and taste is very consistent! We highly recommend that you give this a try! I love granulated garlic. It's excellent in nearly every dish. Especially soups because it really intensifies the flavor of the broth. I always have to have it. I love being able to buy my spices is such large bulk boxes that helps save us money. The granulated garlic is wonderful and comes packaged great. The bulk box of granulated garlic is a great buy. The products comes very nicely packaged and is perfect for large restaurants. The flavor is perfect. This garlic is an outstanding deal you cannot find a better price it is very high quality and taste outstanding these are the best places you can buy for the price. Very potent. We were able to reduce the amount of garlic we include in our Seasoning, which reduces cost. I highly recommend this one for savings alone. It tastes like garlic. It is so convenient and easy to have garlic like this stored and ready to use. It enhances the flavor of many thing but is especially good on hot doughy breadsticks. Very good price on bulk garlic from webstaurant....saved me money even with shipping over local companies... we love webstaurant. This product was similar to any other garlic. The flavor and aroma of this garlic is bold and flavorful. It's great to be able to buy it in bulk at such a great price. If you can buy it and stock up. I was so happy to discover that the spices we were purchasing are available in bulk. If you use a lot of spices, you can save tremendous money by buying your spices here. The quality is consistent and the pricing is great. I use this granulated garlic in about three different recipes and it always adds a fresh-garlic flavor to the dishes. It's such a versatile spice, it can be used on almost anything! I use a lot of garlic in almost everything I create in the kitchen. This is the best granulated garlic I have ever used and at the 25lb. price, the most economical! We love this garlic and have purchased in smaller quantities in the past. We decided to start buying in bulk due to the amount we use. Literally half the price i pay through my vendors! It comes in a bag in a box instead of 5 gallon bucket but at this price point who cares! A great money savor on a high volume item in our kitchen as an part of a house made spice blend or just as it is. Good product at the right price I always add a couple of small items when i order as shipping seldom changes with a couple of little things when i order heavy weight items. This size case of Granulated Garlic is by far the best deal I have found from any source. The quality of the product is very good and is perfect for large recipes. We will continue to order this product. The Regal line of spices is great quality. They are always fresh and fragrant; full of flavor. The granulated garlic is great for seasoning many types of dishes and for use in dry. Its my go to spice at home. High quality seasoning. We use a lot of seasonings daily and this price can't be beat. Wish they would put it in a hard container for shipping purposes but other than that, no complaints.